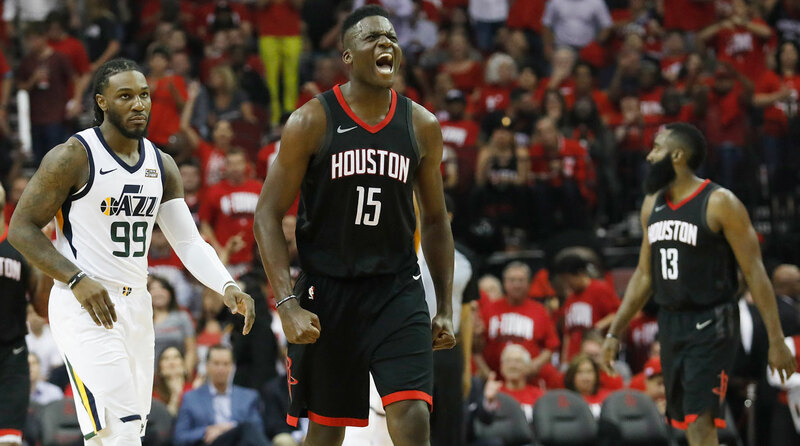 Houston's Clint Capela takes The Crossover through the ins and and outs of the pick-and-roll game—and shows why he's one of the most critical players in the Western Conference finals. To listen to an audio version of this story, check out Breakaway—Sports Illustrated's narrative podcast about how the NBA works. You can find this and other episodes on Apple Podcasts, Stitcher, or Art19. Watch closely on any pick-and-roll and the defense will show you what it fears most. It’s in those situations that a team has to choose what it can live with and what it can’t. You trap a dangerous scorer to take the ball out of his hands. You stay home on shooters to avoid giving up back-breaking threes. Or, if you’re playing against the Houston Rockets: You do everything in your power to keep the ball away from Clint Capela. That may seem counter-intuitive. Houston runs its offense through James Harden, who was the MVP this season and led the league in scoring. Alongside him, the Rockets have Chris Paul—an all-time great point guard having another predictably great year. Capela isn’t the same caliber of star; he’s a 24-year-old center from Switzerland just starting to stake his claim after four years in the NBA. Yet in this specific circumstance, he can present an even bigger threat than his high-profile teammates. If the Rockets can get the ball to Capela on the roll with any kind of opening, they put their offense on its surest path to efficient scoring. When Capela actually attempts a shot on the roll, he converts 70% of the time, according to Synergy Sports—and that’s without accounting for all the fouls he draws in the process. That’s the kind of threat that sets the rules of engagement. “It's all about: what they give to me, I take it,” Capela said. Defenses, however, are deliberate in their attempts to give Capela as little as possible. His play is a big part of why teams like the Jazz drop all the way back to the rim against Houston and why teams like the Warriors want to switch on Capela’s rolls. It’s telling that even in a world where everyone wants to slow down Harden, he can drive around a Capela screen against the majority of opponents and waltz all the way to the rim. You may think of Capela as a sort of decoy in those scenarios. You would be wrong. While Harden sets up his defender with a few dribble moves, Capela sizes up the possession from a completely different angle. The only reason we don’t talk about Capela as a prodigy of spacing and timing is that we’re biased to the ball. We’re trained—through years of watching and playing and thinking about basketball—to recognize the artistry of the pass. There’s such obvious intelligence in the act of assisting that we forget that the player receiving the ball is working to create that same opportunity on their own parallel timeline. The best roll men don’t work as an extension of their point guards. They’re collaborators. Even if he never had a direct say in how the ball moved, a player like Stoudemire changed the shape of a possession with every screen and every roll. If his timing or positioning was even slightly off, a golden opportunity might vanish. For Capela, turning his body even a few degrees on the screen can be the difference between Harden getting a clear drive or having a defender nag at him the whole way through. Setting the screen even a foot higher on the floor might completely change how a defense can approach it. Every detail matters. Before a screen is ever set, Capela reads the moment for all its eventualities. It’s his job to anticipate every possible form of coverage because each would require something different from him in response. 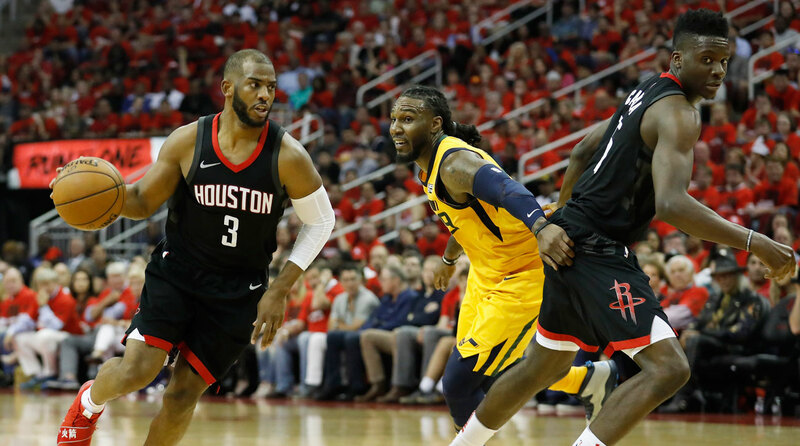 It’s not uncommon for an opponent, in their desperation, to try two or three different varieties of pick-and-roll defense against Houston in the same game. Every change brings a corresponding shift in Capela’s approach, reconfigured within a fraction of a second. That sort of tactical agility has been a propulsive force in Capela’s development. It is not by accident that Capela, who was named one of three nominees for the Most Improved Player award, made a more consistent impact than ever this season. He keeps his contributions relevant by changing with the game around him—something he didn’t always have the awareness to handle even a year or two ago. There is no better test of those skills than playoff basketball, and no more exacting proctor than the Warriors. There is a different level of peril involved when even the smallest mistake might turn the ball over into the hands of Kevin Durant or Stephen Curry. The margin for error is virtually non-existent. Golden State, because of how well they defend and the way they choose to, can cut off Houston’s access to Capela in ways that other teams can’t. The key is getting Golden State’s defense to budge. If you let the Warriors switch and sit, they’ll make Harden and Paul work for every shot in isolation—and probably outscore them anyway. What changed the complexion of Game 2 was that Houston was able to force invaluable defensive rotation. Whether through slipped screens, off-ball movement, or decisive drives, you need that kind of momentum to get anywhere against the Warriors. 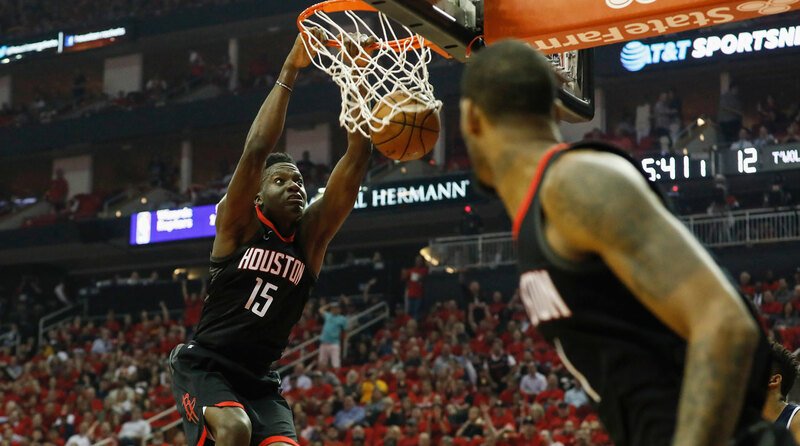 Capela has a part to play in that—not only as a dunker, but as a decision-maker. The Rockets are at their best when Capela is involved – even if he’s just giving Houston another conduit into its offense. That’s really the philosophy behind his entire game. Capela barely got to catch the ball on the roll in the last round because Utah made rim protection an absolute priority. Still, Capela sprinted into his screens and rolled every time—a pressure that opened up scoring opportunities across the board. “The threat of him at the rim is why I get my floater, is why I get my mid-range,” Paul said. That “record” Paul mentioned? Houston is now 51–6 when Harden, Paul, and Capela all appear in the same game. Their win percentage, as a core, rivals that of a Curry free throw. Much of that is owed to Capela, who even makes it easier for Harden and Paul to create for themselves. Houston’s isolation play this season was historically effective, in part because it was rarely a pure isolation. The Rockets run ball screen after ball screen until they create their desired mismatch. (Curry, for example, is their target of choice on the Warriors.) And defenses go along with it, because a mismatch on Harden is still preferable than him throwing a lob to a wide open Capela. The threat of that lob, in many cases, is what forces the switch. And once the switch happens, it’s that same threat that causes the help defense to hesitate. Simply by lurking along the baseline, Capela can change an opponent’s internal calculus of when and how to provide help. Even if Harden blows by his defender on the perimeter, the rotation away from Capela isn’t automatic. The possibility of a lob becomes its own form of spacing. The trick in this series—and in any series—is finding ways to stay ahead of an opponent that learns more about you with every game. The Warriors already have a great feel for the patterns of the Rockets’ offense and will only grow more familiar. That leaves Capela and his teammates searching for opportunities against a defense that is both highly intelligent and increasingly predictive. For the Rockets to consistently create the kinds of shots they want against the Warriors, Capela will need to understand his guards implicitly. Harden and Paul are brilliant creators who approach the same problems in entirely different ways. Any defensive scheme that Houston encounters will be unraveled from two directions at once: Paul methodically tugs at every weakness just to see how they the defense might respond; and Harden, on the other side, pulls on a single strand with such force that he begs opponents to overreact. This, in essence, means that there are two Capelas. The first works with Harden, whose primary goal is to get driving downhill—with Capela in tow—as quickly as possible. To create that kind of lane, Harden relies on one of the shiftiest off-the-dribble games in the league. If you’re playing against him a handful of times a season, it’s almost impossible to pin down his timing. Misdirection is the fiber of his game. And Capela, as his pick-and-roll partner, has to see the truth beneath Harden’s inscrutable moves. Capela, not unlike those tasked to defend Harden, is always parsing which of the guard’s hesitations are real and which are merely a setup. He’s on the lookout for signs that Harden might accelerate—because if he does, Capela will need to match his pace. Part of the reason why Capela plays so effectively off of Harden’s drives is that he’s learned, over time, how to mirror him. Their connection bears out in the fact that Harden assisted Capela more than twice as often as he did any other teammate. In fact, Harden to Capela was the second-most prolific assist combination in the entire league this season—despite the fact that they played just 66 games together. (The top assist pairing: Oklahoma City’s Russell Westbrook and Steven Adams.) The synergy between the two Rockets is that strong in part because Capela keeps getting better. You can actually see Harden’s confidence in Capela articulated most clearly in their missed connections. If he sees Capela running the floor in transition, Harden will fire off lobs from halfcourt. If an opponent happens to be nearby, Harden might still throw the lob—just even higher than normal, trusting that Capela will soar to claim it. There’s a lot in that relationship for the Rockets to work with. Capela and Harden have such vivid chemistry that Houston can even run its pick-and-rolls sideways—starting with Harden catching the ball in the corner and Capela rolling out from there. That kind of reorientation completely changes the geometry of the play. But when you have two teammates who know each other and know their angles, everything else falls into place. It would be impossible for Capela to have that kind of relationship with Paul, because there’s really only so much you can learn about a teammate in seven months. Beyond that, their dynamic is completely different because Paul is completely different. When Capela catches a pass from Harden, it almost always leads directly to the rim. Harden will keep driving until the defense stops him, and Capela will keep rolling until the alley-oop comes. Paul moves at a different speed. He used to live in Lob City, but he tired of it. A change of pace was part of the appeal in his coming to Houston in the first place. This is where we find the other version of Capela, one that understands every pick-and-roll with Paul to be part of a more deliberate process. That starts with the screen itself—a mechanism that works differently for Paul than it does for Harden. “Chris needs a little bit more space, so I try to hold more on the screen,” Capela said. “Holding the screen with him makes his job easier, creates space for him to look for the shot or to read the situation. To go back or across. So with Chris, it's more holding the screen and let him read. Give him more time." Dissecting the Deadline Four: Did the Cavaliers Ever Have a Squad? Paul’s creative process is sprawling. After working around a Capela screen, he might weave through the lane and back up toward the top of the floor, leaving the help out of position and another defender scrambling behind him. Capela’s job is still to roll, but into specific spaces. He’ll find a pocket in the lane, or a deep seal against a mismatched opponent. And so with every pass, Paul demands something relatively new of Capela: He wants him to make a move. He wants Capela to catch the ball at 10 feet, take a hard dribble, and pivot his way into a layup. He wants Capela to get the ball mid-stride and eurostep around the defense. He wants to see Capela claim position, pump fake, step through, and shatter any preconceived notions that he’s some kind of mindless dunker. “I mean, the sky's the limit for Clint,” Paul said. Capela won’t ever be able to create offense as well as Karl-Anthony Towns, but he can play within his role in a way that dominates Towns in a playoff series. A team like Utah might scheme to take away what Capela does best, but then it can’t deny the opportunities he creates for the rest of the Rockets—even at the expense of the likely Defensive Player of the Year in Rudy Gobert. Houston has the flexibility to go as small as is needed in the Western Conference finals. But it’s hard to imagine a path to beating Golden State that doesn’t involve Capela playing some of the highest-level basketball of his career. If he gets there, it will be because playing with Paul has made Capela a more well-rounded player. It will be because he pored through old film of Stoudemire on D’Antoni’s Suns—not for the lobs, but for the timing and the footwork. For the value that Amar’e found in delay. Steve Nash deserves credit for always keeping his dribble alive, but it was Stoudemire who turned those extended detours into a devastating weapon. Capela is figuring out how he can do the same. Sometimes, that results in a dunk. More often, Capela attracts so much attention that Houston gets another wide open look—whether from a corner marksman or one of the best mid-range shooters in modern NBA history. The pick-and-roll with Paul is a waiting game. And the longer it goes, the greater the chance that Capela and the Rockets will get just what they want. That Capela’s game seems simple at this point is really evidence of how much information he’s absorbed. Anyone can listen to what a coach tells them and consciously enact it, but opponents will sniff out overly deliberate play from miles away. There is nothing more blatant in basketball than a player trying to execute a game plan they haven’t fully processed. They navigate the floor with all the subtlety of a student driver. What separates players like Capela is their immersion. He has seen every coverage, made the reads available to him, and effectively internalized it all. The lessons from walkthroughs and film sessions now run closer to instinct—a critical expedition of Capela’s process. There is a tendency in basketball circles to look at every athletic center as if he could do what Capela does. Be a Tyson Chandler type. But the reason more centers don’t play like Capela is incredibly simple: It’s because they can’t. They’re not as coordinated. They’re not as explosive. They don’t have the hands to rein in both wild lobs and sharp pocket passes. They don’t learn as quickly or won’t accept criticism. They don’t dedicate themselves to what can be a hard and thankless job. Some want to shoot threes. Others want to post up instead. You don’t think Clint Capela wants to post up? Capela ate better, got in the weight room, and he grew into the kind of center who could give the Rockets 35 all-out minutes. He did what so many others don’t. And in the process, he became one of the very best players of his kind. Capela, who will be a restricted free agent this summer, will soon be rewarded handsomely for that fact. But as it stands now, Houston’s entire season rides on two intersecting truths: First, that Capela is an essential part of how the Rockets play; and second, that the Warriors exert an incredible amount of pressure on opposing centers. Trot out any kind of traditional big man and Golden State will run them around screens, pull them out 30 feet from the basket, and force them into long rotations. Most teams turn to smaller lineups as an act of survival. Already we’ve seen Tucker play effective minutes at center in this series, providing the Rockets with an alternative in case of emergency. But what gives Capela some staying power is that he appears to be the rare center who can actually switch. Capela handled more switching possessions as a defender than any player in the league this season, per Synergy, and he shuffled his feet well enough to get by. In the playoffs, he’s been even better. Players like Jimmy Butler and Donovan Mitchell haven’t been able to get anywhere against Capela’s length. His one-on-one defense has held up, in part because it’s become a point of pride. Even Curry and Durant have had their trouble working around Capela at times, which is a central reason why he’s been able to stay on the floor. But Capela’s trial by switch is still in its earliest stages. Golden State has ways of attacking that matchup they haven’t shown yet, and might look to attack him should they branch out beyond picking on Harden’s defense instead. Capela will have to hold up and, if anything, he’ll have to do more. Playing against the Warriors can be a clarifying experience. 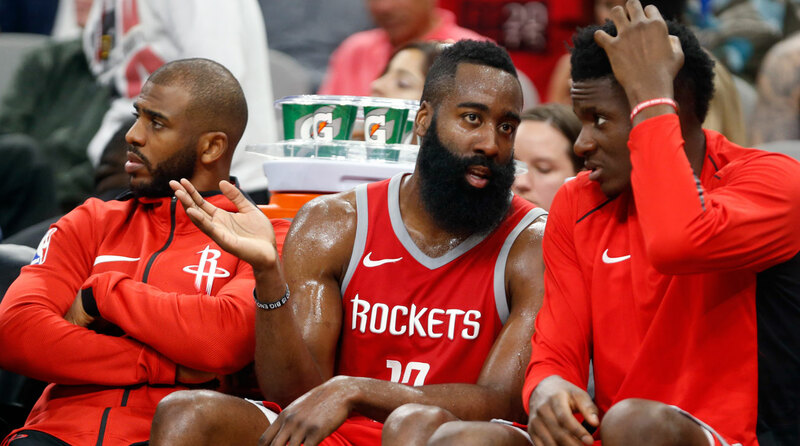 Eventually, Golden State will put Capela to the fire, and D’Antoni will have to consider just how much he trusts his center and whether Capela’s contributions are really something the Rockets can afford to limit or to lose. Somewhere, deep down, they already know the answer.